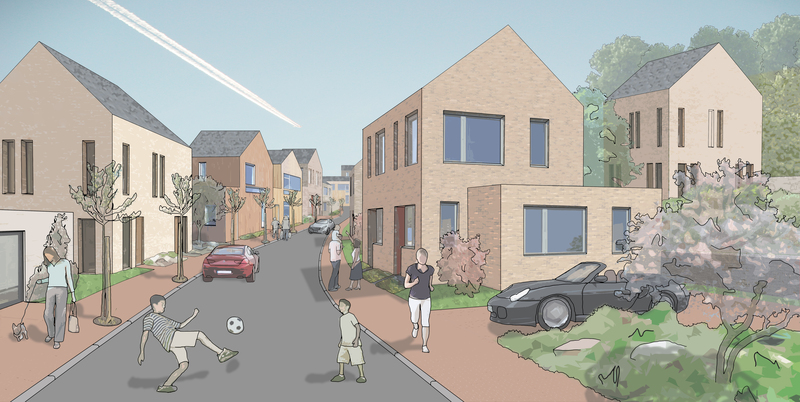 URBED worked with URBO between 2011 and 2015 to develop a sustainable urban village in North Bradford. The project is being brought forward by a development partnership between regeneration company Urbo and Bradford Council, which has been created to guide, manage and secure development in Bolton Woods over the coming years. URBED were appointed to develop the masterplan, design guide and sustainability strategy for the scheme. The design team was made up of the following: URBED (Masterplanning), HOW (Planning), OMI (Architects), Stockleys (Technical), Aecom (Transport), TEP (Ecology) and Planit (Landscape). Bradford Metroplitan District Counil granted outline planning permission for the New Bolon Woods masterplan in November 2015. This will see over 30 hectares of land being developed and will include 1000 new houses, a new local centre with shops and a primary school as well as new and improved sports facilities and a health centre. A detailed planning application was also submitted alongside the outline application, and this granted permission for a new foodstore which will be constructed on the site of the old Lavers timber yard. Phase 1 of the development saw the first 50 homes completed on the site in 2014. URBED developed the masterplan following a series of public consultation events which were used to inform changes to the design. Following comments from local people and businesses changes made included more sports pitches, and retaining green areas of land to the north of the scheme, which were of a particularly high value to neighbouring residents. NBW: Planning Permission is Granted! Last week Bradford Metroplitan District Counil granted outline planning permission for the New Bolon Woods masterplan. This will see over 30 hectares of land being developed and will include 1000 new houses, a new local centre with shops and a primary school as well as new and improved sports facilities and a health centre. The first 50 homes have already been completed, and planning permission was granted for a new foodstore which will be constructed on the site of the old Lavers timber yard. 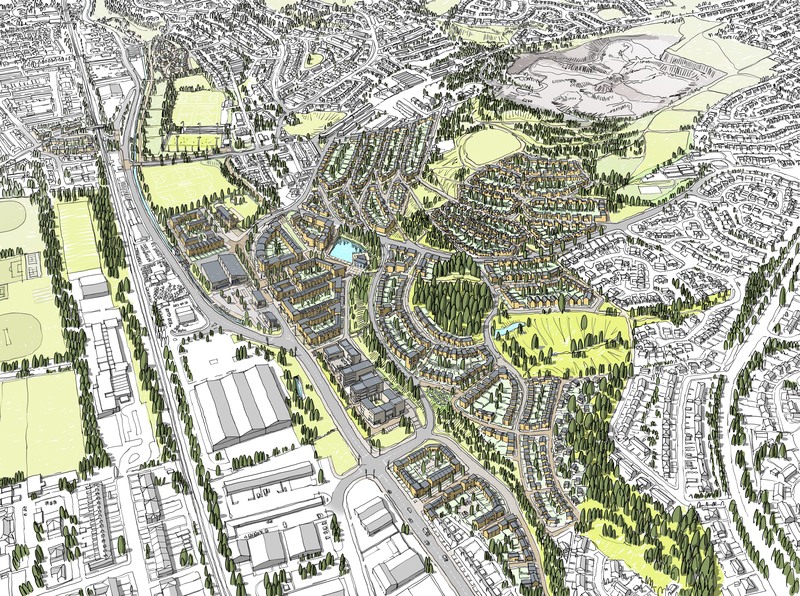 New Bolton Woods Hybrid Planning Application - the overall masterplan for the Bolton Woods Area. Retail Development at Stanley Road - the detailed application for the foodstore on Stanley Road, Bradford. In November 2014 we assisted the design team to submit a"hybrid planning application" for New Bolton Woods. This is for a mixe use masterplan consisting of up to 1000 new houses, a local centre with shops, health centre, a new primary school, sports pitches and green spaces as well as new public squares and a new small foodstore. The application can be viewed online on the planning portal. The planning application will take several months to be assessed by Bradford's planning department. The Application reference is: 14/04818/MAF. Please follow this link to see the application and make any comments. A separate "detailed planning application" has also been submitted for the retail development of the small foodstore in the local centre. This application can be seen here. In terms of the wider masterplan the main focus of our work has been to prepare for making a planning application for the entire project in Summer this year. We have been delayed due to some technical matters but as with the first housing, we have still been able to make some delivery progress. This should result in early development of a new food store in the Local Centre and provision of a new, full-sized high quality all-weather sports pitch. Both of these could be completed by early next year. The planning application is likely to be submitted later in the summer and we expect to present more details on the revised plans to the local community before the submission. NBW: Come and see the proposals! We would like to take the opportunity to present to you the updated masterplan for the area, which incorporate the comments made by the community and local residents during previous consultation events. These proposals will be submitted as an Outline Planning Application to Bradford Council in early summer 2013. You can view the final proposals by using the links to the right. Please come along to one of the meetings or drop-in exhibitions in the next few weeks, the details are below. We would like to invite you to view an exhibition of the Planning Application proposals. Canal Road Urban Village Limited (CRUVL) and its technical team will be at the event to answer any questions you have about the plans. We will also be holding two evening meetings, which will consist of a short 10-minute presentation given by the consultancy team on the masterplan, and they will the answer any questions you have about the proposals. Free Post any comments you have using our freepost address: FREEPOST, URBED, 5th Floor, 10 Little Lever Street, Manchester, M1 1HR. NBW: Thanks to everyone who came to the brilliant Wrose Carnival! Well, the rain held off – just about – and we had a great day talking to people at Wrose Carnival. We would like to thank everyone who came to speak with us and made comments about the regeneration plans for the area. If you couldn’t make the carnival you still have a chance to comment until Sunday 15th July. Below are boards which show the plans for the Bolton Woods area. Please take a look and fill in an online questionnaire letting us know your thoughts and what you would like to see happen to Bolton Woods in the next few years. Housing character – Please click on these when completing the questionnaire to get an idea of the different housing types. We will be attending some local events around Bradford to hear people's opinions on the regeneration plans for the area. Please come along! We’ll be at the URBED marquee, come and find us as we would love to hear your views. Below are board which show the plans for the Bolton Woods area. Please take a look and fill in an online questionnaire letting us know your thoughts and what you would like to see happen to Bolton Woods in the next few years. We have been developing a Vision document that sets out the aspirations for “The New Bolton Woods - a thriving village with all its own amenities.” This document sets out URBED's design brief for developing a masterplan for the area. We have started a series of public workshops to engage the community about what they want to see in the new Bolton Woods. Please check this blog for more information about future events, or get in touch with us to let us know your views about the area.